The vast majority of us have been on a budget at some point in our lives and with todays economic climate certainly not looking to improve, we’ve all had to tighten the purse strings lately. But why should this mean compromising on treats like eating out? Visiting restaurants and cafes is one of the most relaxing and social ways of spending time, so how do you go about doing so in one of the most expensive cities in the UK? 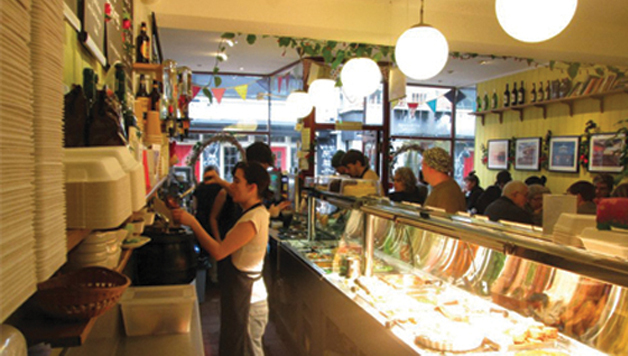 Below are some top suggestions for eating out in Brighton and Hove whilst on a tight budget. 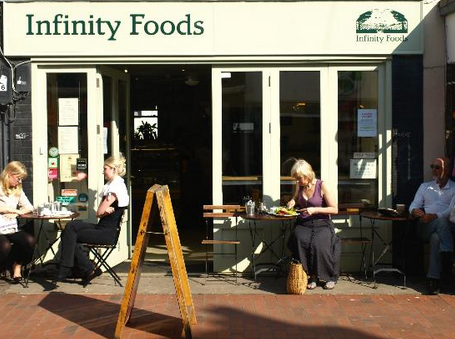 Infinity Foods Cafe is a fantastic place to stop for a quick and healthy bite to eat, without breaking the bank. Serving only vegetarian or vegan food, the cafe prides itself on the fact that every ingredient is not only organic, but also free from GM and hydrogenated fat. Offering a combination of light bites, salads and breakfasts, Infinity Foods Cafe is a great budget eatery. Prices start at £3.30 for homemade soup, £3.50 for salad boxes and £5.50 for jacket potatoes with a variety of great toppings, including spicy dhal and veggie chili. 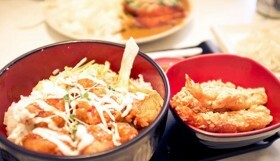 Looking for a decent restaurant lunch for under £5? Look no further than Sukhothai Palace. 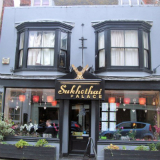 Offering two courses of wonderful, homemade Thai food for £4.95, Sukhothai is the one stop shop for workers on their lunch breaks and shoppers taking 5. Choices include tom yum soup, wonton parcels, red thai curry and pad thai. 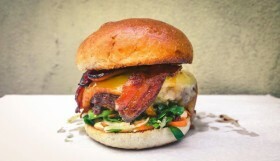 Available everyday from 11.30-5pm. 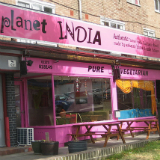 Hotly touted as one of the best Indian restaurants in the city, Planet India is certainly worth the walk to the bottom of Hanover to give their vegetarian cuisine a go. Incredibly cheap with super large portions and a menu offering something for everyone, Planet India is a must for those dining out on a budget. 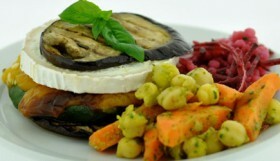 Half portion mains (220g) start at £3.50 with full, larger portions (360g) starting at £5.50. You can also mix and match between portions, so half and half masoor dali curry and spinach and paneer curry? Yes please! It may surprise you that I’ve put what is perceived as a high class establishment in this budget eats article. 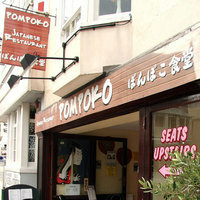 However, if you time it right with Cote you can get a top class meal for under a tenner. Each day between 12-7pm Cote offers 2 courses for £9.95 with a great choice of dishes on rotation including chilled watercress soup, calamari with rocket and duck and pork terrine to start or salmon fillet, coq o vin and steak frites for main, as well as lush desserts including creme caramel and iced berries with white chocolate sauce. 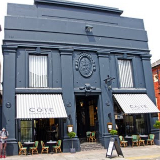 Perfect for pre-theatre or post-work dining, make the most of the wonderful Cote restaurant and take full advantage of top quality French bistro influenced food at rock bottom prices. 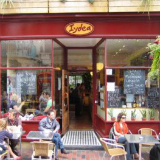 Iydea is another of my favourite Brighton eating establishments because I know the food I’m being served is fresh, lovingly made, free from nasties and good value for money. Famed for their large portions and vegetarian/vegan friendly menu, Iydea is a great place for an early evening meal or a lunchtime take away. With meals ranging from around £4 and up to £8, you won’t find a more healthy nor filling dinner or lunch option than Iydea. Think a choice of goats cheese arancini, chilli bean enchilada, aubergine and goats cheese stacks all served with sides of cajun potato wedges, green beans with almonds or pasta and roasted peppers. Delicious!